When the rest of Spain was enjoying the Renaissance in the 16th century, Barcelona was heading for the dump. What city historians call the Renaixença refers to instead is the great renewal that began in the 19th century, when Barcelona emerged from its walls like a butterfly bursting out of a cocoon. 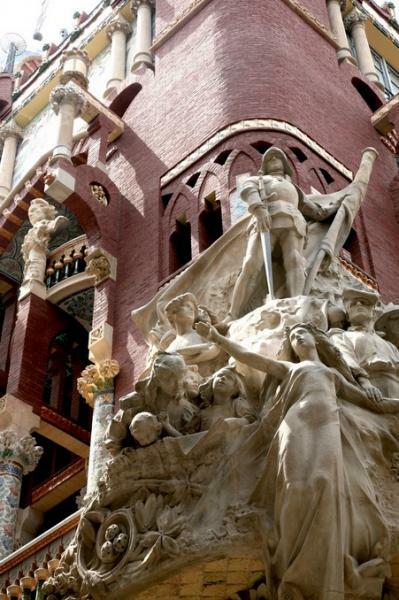 Its breathless expansion and cosmopolitanism soon evoked comparisons with the kingdom of Aragon's medieval golden age and fostered a new pride in things Catalan. Fundamental to the Renaixença was the movement to redeem and re-establish the Catalan language, long submerged by the forced Castilianization of Madrid. As with the Czechs, the Irish and many other peoples, language was the key element of a new nationalism. Catalan dictionaries and grammars had first appeared during the Napoleonic occupation; by the 1830s, Barcelona journals were printing the first new poetry on Catalan patriotic themes. Catalan poetry competitions, the Jocs Florals, that last took place in the Middle Ages, were revived in 1859, part of a literary crusade led by Catalonia’s finest and most beloved 19th-century poets, Jacint Verdaguerr (1843–1902) and Joan Maragall (1860–1911). Both were key figures in bridging the language of the troubadours with the everyday language still spoken by the people. From there, the Renaixença grew into a fervent nationalist cultural movement in all arts, from music (notably in the huge expansion of Choral Societies) to architecture. Another key organisation was the Centre Excursionista de Catalunya, founded in 1876 to promote scientific expeditions, although it soon expanded its role to every aspect of Catalan cultural life. One was exploring and reviving interest in the region's magnificent Romanesque architecture, a facet the particularly impressed the young Gaudí. In this heady climate, under dynamic mayor Francesc de Paula Rius i Taulet, the city put on the Universal Exhibition in 1888, set in the new park where the recently demolished Ciutadella had stood, which saw the beginnings of Barcelona’s distinctive Modernista architecture. When the Queen of Spain came to open the exhibition, she was welcomed as the ‘Countess of Barcelona’ by the main nationalist organization, the Lliga de Catalunya, which also presented her its agenda for greater political autonomy, which she of course politely ignored. Little did Madrid know that it was only the opening salvo in what would become a long up-and-down relationship.